No, I didn’t put random letters as the title of this post. 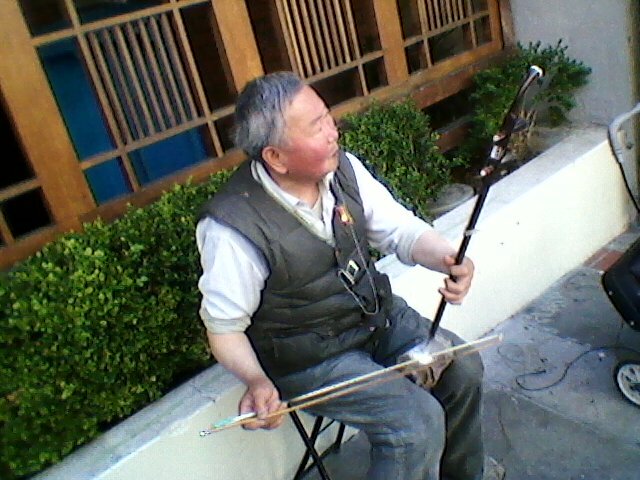 The Erhu (or 二胡) is a traditional Chinese musical instrument, and the sound you think of when you think of Chinese music. It’s a 2-string bowed instrument that Westerners often refer to as the “Chinese fiddle”. A traditional Chinese instrument, it’s also used in contemporary music. The Erhu can be traced back over a thousand years, and were made of python skin and silk strings. In the 20th century, steel strings gradually became the professional way. In 1988, China severely regulated the use of python skin, as the snakes were becoming endangered. From 1 January 2005 onward, each Erhu made had to be certified as using farm-raised python skin and not wild python skin. This makes them be very expensive. A few months back I looked into buying one, and the cheapest real one I found was over $300. Just the cloth to clean it was over $50. I became interested in the instrument last year, when I visited San Francisco in July 2011. I was walking through Chinatown when I saw someone playing one. It was something I had never seen before, and although I grew up hearing the music of China, I had never heard the instrument live in person, or even knew what made that sound. I was able to take a picture of the person playing it. This entry was posted in Blogthoven and tagged Chinese, Erhu. Bookmark the permalink.